tags: This A Is For Action! Dragon Ma is back, having rid the seas of the dreaded Pirate Lo. Back on land, he is assigned to the police force, where he is to clean up corruption and crime in a local suburb. Along the way, he is caught up in the fate of several Chinese patriots attempting to secure sympathy and support for their revolutionary cause. The Chinese Manchu government is after these revolutionaries, and anyone that stands in their way is in trouble, even if they are in the police force. Dragon is now transferred to be the police head of Sai Wan district, and has to contend with a gangster kingpin, anti-Manchu revolutionaries, some runaway pirates, Manchu Loyalists and a corrupt police superintendent. Sequels are a capricious lot with most nowhere near the stature of the original. Sometimes you find a sequel that is considered better than the original, some critics (such as John Charles) have stated that Project A2 is better than the original, I disagree somewhat but this movie is still a worthwhile follow-up and fits well in the output of brilliant Hong Kong action cinema in the 1980s as well as Jackie's own oeuvre. I do wonder how with such an awesome release of great films that his later films were not as good. He only has directed two films in the 1990s and none past that, but he has had much clout in many of the films where he is not officially the director. Earlier in 1987 Jackie had brain surgery following a disastrous fall in the filming of Armour of God. This encouraged him to work on his next film close to home. This did not encourage him to stop risking his life and his stunt team for our amusement. What resulted is a smash hit at home that eclipsed the original in box office tallies (31 million HK dollars compared to 19 million for the original). 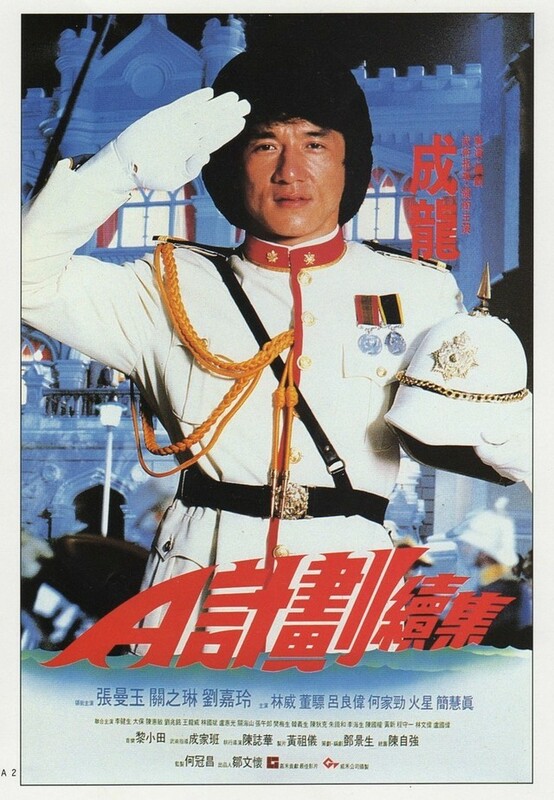 Jackie Chan is once again police officer extraordinaire Dragon Ma and he is ordered to work with "Three Wan" Superintendent Chun (Lam Wai, Royal Warriors) who is the only Chinese police officer allowed to have a gun yet is thought to be staging arrests to make himself look better and ignoring the crimes of a triad lord named Tiger Au (Michael Chan Wai-Man, Dragon Lord). Apparently Chun has too much power to be taken down directly, but he is relieved of the Sai Wan district (now he is "Two Wan") which Dragon Ma takes over. This inefficient and corrupt office will soon get a makeover and there is a great scene where three officers, who do not know who they are dealing with, attempt to assault Ma to teach him a lesson about complaining about police officers. He soon has that district ship-shape and Tiger Au taken care of. The fight choreography and stunts with Tiger and his men are quite awesome. My favorite stunt was a beautifully brutal fall from the second floor into a large vase and that vase did not appear to be soft. Meanwhile a couple of subplots are happening. There are pirates who have survived from the first film who are looking for revenge and food. Then there are revolutionaries including Maggie (Maggie Cheung, In The Mood For Love) and (Rosamund Kwan, Casino Raiders) who are trying to raise funds for Dr. Sun Yat-sen to overthrow the Qing Government as well as government operatives who are trying to find these rebels. Throw in a mixture of corrupt Hong Kong and British Cops as well as legitimate ones and you have a stew that is getting a bit too many ingredients, but yet still seems to coalesce. This works well when there is a Marx Brothers influenced scene (the Marx Brothers have done this type of scene a few times with The Cocoanuts (1929) being the first) at Maggie's place where everyone is looking for someone while hiding from someone else. Many weeks were spent on this scene alone and the effort certainly shows.